Hello! My name is Ron Buening, and I am the pastor of Beacon Baptist Church. I have been married to my lovely and gracious wife, who is the mother of our two precious daughters, for 20+ years. The Lord has truely blessed me with a wonderful family. To help you understand who I am, and where I come from, I would like to share my testimony concerning salvation and call to ministry. I was born and raised in Coldwater, Ohio. A few years after graduating from high school I moved to Illinois, and later to Oklahoma. While living in Enid, OK, I had some very godly landlords who greatly influenced my life. It was the love of Christ that I saw in them, that influenced me to get saved. One night I was having a drunken party in my apartment, and they came over and told me to keep the noise down. I got very nasty with them for telling me to be quiet. After a short time the police came, and I got into a scuffle with an officer, and I was the one who suffered for that. The next morning when I woke up in jail, I began to consider the situation that I now found myself in. The future was not looking to good. I was unemployed, and could not bail myself out of jail, and I had no real friends that would bail me out either. I was already behind on my rent payments, and after what I did the night before; I did not think I would have a place to live. While pondering my situation, the jailer came to my cell and told me someone had come to bail me out. I did not think anyone would ever do that for me, and I had the biggest shock of my life when I saw that it was my landlord. Well to make a long story short, I started going to church with my landlord, and I was certain that the preacher was only speaking to me when he was preaching. After attending several services with them, it hit me like a thunderbolt in the middle of the week that I was lost and on my way to hell. I immediately started praying and asking God to let me live until Sunday, so that I could go forward and find out how to be saved. Praise the Lord, Sunday came and I was still alive, so when the invitation was given, I pulled my hands lose from the pew in front of me and went forward to get saved. My life has been radically different from that day, and I have no regrets. After salvation, I began to read the Bible for hours every day. I did not want to be fooled by another religion, like I had been previously. Being in God’s Word every day, it was not long until I heard God asking me to give my life to Him. I wrestled with God about this for some time, but one night lying on my bed I said, “OK Lord, I will become a preacher for you.” When I said OK, the burden that I felt immediately left me. When I ask the Lord why the burden was no longer there, He reminded me of what I had just said, and He was now testing me to see if my word was any good. After talking to my pastor, I started my preparation at Baptist Bible College the next semester. 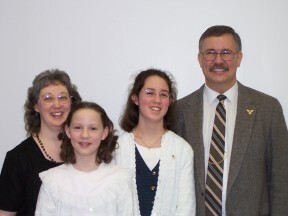 Upon graduation from college in 1987, me and my wife came to North Dakota to start churches. I have been involve in a few works in the state, but have been laboring in the Grand Forks area since 1993. Copyright 2009 Beacon Baptist Church. All rights reserved.